Potato Macaroni salad, also known as “potato mac salad” is a popular side dish served in plate lunches all over the Hawaiian Islands. You will typically find either macaroni salad or potato mac salad scooped next to a couple mounds of rice along with a sauce ladened grilled meat such as Kahlua Pork or Shoyu Chicken. In Hawaii, the locals like to use a generous helping of mayonnaise in their potato mac salad to make it extra creamy and it has to be Best Foods mayonnaise or it will not be considered authentic Hawaiian style. Each Hawaiian cook has their own variation of potato macaroni salad using varied ingredients. 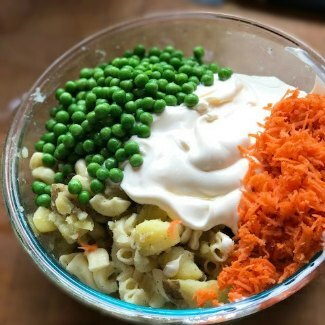 In this recipe, we will feature typical ingredients of potatoes, macaroni noodles, hard boiled eggs, vinegar, mayonnaise, peas, and carrots. Try the traditional recipe and by all means, have fun experimenting and adapting to your preferred ingredients. I have also provided instructions to make it easy to cook the potatoes, macaroni noodles and eggs at the same time in the Instant Pot pressure cooker and I have included stove top instructions. 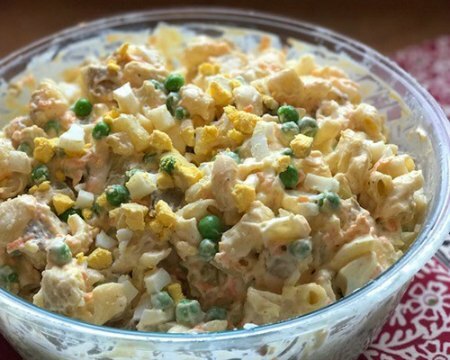 Many food experts and historians have been asked over the years about the history and evolution of potato mac salad and macaroni salad in Hawaii. None have been able to set an exact time or incident. There are a couple popular theories discussed on the evolution of the creamy mayonnaise-based potato mac and macaroni salad. When big hotels started to open in Waikiki as early as 1901, hotel chefs were hired from the New York hotel scene. These chefs were of European descent from mainly Italy and Switzerland. They made potato salad and macaroni salad a popular hotel menu item in the early twentieth century. As East Coast chefs were transplanted to new hotels in Waikiki, they brought with them recipes for popular salads in New York to appeal to the taste buds of mainland vacationers. The other theory that gets discussed is that the sugar and pineapple plantation owners being of European descent could have introduced macaroni and potato salad to the Hawaiian Islands in the early 20th century. They would request their domestic help, mainly Asian immigrants, to prepare cold potato and noodle salad dishes which exposed the European cooking styles to the plantation workers. It was also common for plantation workers to boil potatoes to leave at home for their children to eat as snacks after school. The children would enjoy dipping their potato pieces in a mixture of mayonnaise and soy sauce (shoyu). 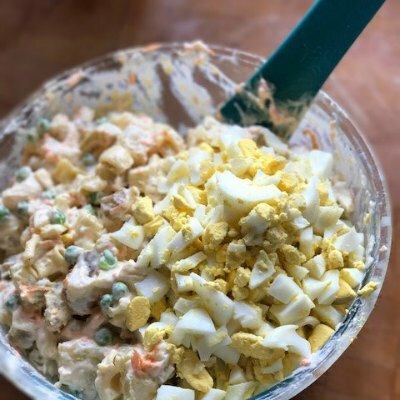 It could be very likely the introduction of potato and macaroni salad at the plantations and ingredients for a common kid’s snack melded into each other to create Hawaiian style potato salad. 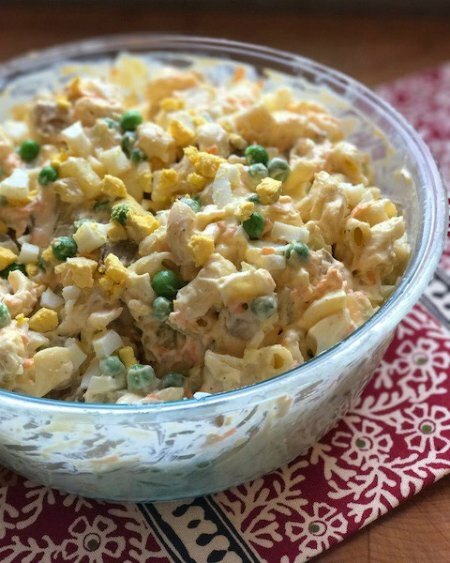 Over the years, potato and macaroni salad have been adapted to local preferences by using an abundance of mayonnaise and elbow macaroni noodles. 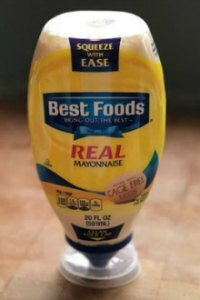 Homemade mayonnaise could be made inexpensively with vegetable oil and egg yolks. In the 1930’s, people used to have mayonnaise making jars given out by the Wesson oil company as a promotion to get people to buy their cooking oil. 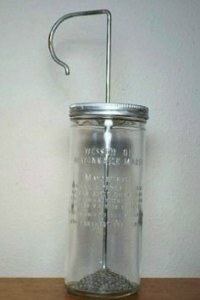 It was a glass jar with a lid and a beater handle to manually beat your own mayonnaise. The recipe for the mayonnaise was embossed on the side of the glass jar. Dried macaroni noodles were also economical to purchase and could help stretch a potato salad further or completely replace the potatoes. Hawaiian’s love their macaroni salad so much and consume in large quantities. It is estimated that a million pounds of dried macaroni noodles are shipped to the Hawaiian Islands per year to support the macaroni salad habit. * The cooking time will vary depending on the size of the potato chunks. Cubing the potatoes smaller allows for a quicker cooking time in the Instant Pot. **If you do not have distilled white vinegar on hand, apple cider vinegar can be substituted. *** Can substitute Hellmens mayonnaise which is the East coast brand name for Best Foods. You can also substitute another brand of mayonnaise. The large quantity of mayonnaise is authentic to Hawaiian recipes which makes the salad extra creamy. If you wish to use less mayonnaise, start with 1 cup and then add ¼ cup at a time until the salad reaches your preferred moistness. Add dried macaroni noodles to inner pot and cover with water. Then place a trivet or strainer basket over the noodles. For the next step, place the cubed potatoes in the strainer and layer the eggs on top of the potatoes. Cover with lid and close to seal. Adjust the steam valve to closed position. Select the Manual button, high heat settings. Adjust cooking time to 4 minutes. While the macaroni noodles, potatoes and eggs are cooking in the Instant Pot, stir together the vinegar, garlic salt and black pepper in a small bowl and set aside. When cooking time on the Instant Pot has completed, open the steam valve to quick release all the pressure. Open the lid once all the pressure is released and you see the pressure pin has dropped. Note: It takes about 10 minutes for the Instant Pot to come to pressure before the cooking time starts counting down. Remove the hard boiled eggs and place in cold water to cool down. Next, remove the cooked potatoes and set aside on a cutting board. 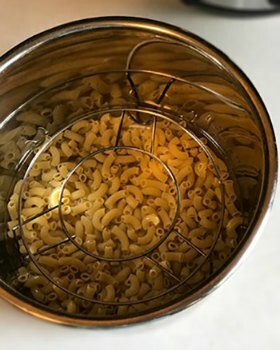 Pull the trivet or strainer out of the inner pot and drain off any excess water from the macaroni noodles. 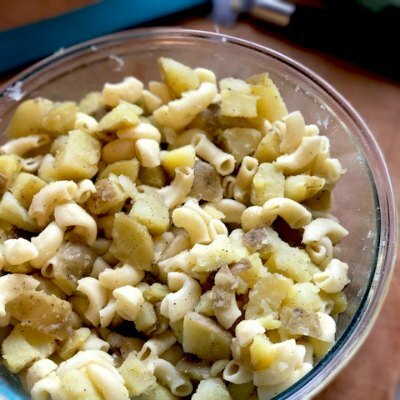 Chop the cooked potatoes into smaller ½ inch cubes and add to a large bowl, then add the cooked macaroni and stir together. While the potatoes are still warm, stir in the vinegar seasoning mixture so the potatoes and the noodles will soak in the vinegar and seasonings and then set aside. *This step is one of the tricks to the Hawaiian technique to flavor the potatoes! Peel the shell off the hard boiled eggs and discard the shell. Chop the hard boiled eggs into small chunks and set aside. Fold the mayonnaise into the potato and macaroni mixture until well combined. Next fold in the peas, shredded carrots, and onions. As a final step, gently fold in the chopped eggs. Cover the salad and refrigerate for 2 hours before serving. Scrub potatoes. Leaves skins on if desired, or peel thinly and remove eyes. In a large pan over medium-high heat, add potatoes and cover with cold water; bring to a boil. Reduce heat and simmer, uncovered, approximately 15 to 20 minutes or until just tender (the cooking time will depend on the size and weight of your potatoes). Potatoes are done when the internal temperature registers approximately 200 degrees F. on your cooking thermometer. Remove from heat and drain. NOTE: I usually remove the skins when the potatoes have cooled enough to hold. As soon as you can handle the potatoes, cut the warm potatoes into bite-sized chunks and place in a large mixing bowl. While the potatoes are cooking, place room temperature eggs in a single layer in a pan and fill with cold water until there is approximately 1 inch of water over the top of the eggs. Place the pan on the stove over high heat setting. Bring the water to a rapid boil, then immediately remove the pan from the heat and cover with a lid for 17-20 minutes (depending on the size of your eggs). Remove lid and drain off water from the eggs. To stop the egg cooking process, transfer the eggs to a bowl of ice water. Let the eggs cool for at least 10 minutes in the ice water, then drain and set aside. Learn more on How to Boil Perfect Eggs. While the potatoes and eggs are cooking, you can move on to cooking the macaroni noodles. In a small sauce pan, add 1 cup of dried macaroni noodles and add 2 cups of cold water. Stir the noodles into the water. Place the saucepan over high heat setting on the stove. Let the water come to a boil, then turn the heat down to medium low to let simmer. Stir the noodles again to help prevent sticking to the bottom of the saucepan. Let the noodles cook for about 9 minutes, while stirring occasionally. The noodles are done when tender (but not mushy). Remove the noodles from the heat and drain off the excess water. Add to the mixing bowl with the cooked potatoes. 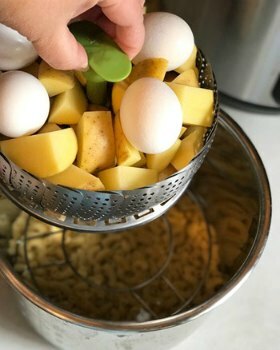 While the macaroni noodles, potatoes and eggs are cooking, stir together the vinegar, garlic salt and black pepper in a small bowl and set aside. While the potatoes are still warm, stir in the vinegar seasoning mixture so the potatoes and the noodles will soak in the vinegar and seasonings and then set aside. *This step is one of the tricks to the Hawaiian technique to flavor the potatoes! Fold the mayonnaise into the potato and macaroni mixture until well combined. Next fold in the peas, shredded carrots, and onions. As a final step, gently fold in the chopped eggs. This is the type of pressure cooker that I prefer to use in my cooking: I get readers asking which electric pressure cooker brand I prefer to use for cooking. I personally use the Instant Pot Multi-Use Pressure Cooker. I love having 7 cooking functions in one space saving appliance – Pressure Cooker, Slow Cooker, Rice Cooker, Saute Pan, Steamer, Yogurt Maker, and Warmer. Thank you!! I just got my Instant Pot and this was the second thing I made in it, everything turned out PERFECT!! I was amazed!! So much less time to make potato mac salad!! I also threw in a can of tuna at the end to mix in cause I love tuna in my potato mac!! Having married into a local family 20+ years ago, there are certain ways to make the local favorites. Don’t fancy it up (one of my early mistakes), have plenty for all and most of all keep it simple! This recipe NAILS IT! My husband loves plate lunch and only goes to certain places because they are the ones that know how to make their potato mac salad. The first time I made this, he said, “Honey, you get ’em.” So, this is THE recipe I use. Mahalos! What kind of vinegar do you use in this mac/potato salad recipe? I used distilled white vinegar. If you don’t have it on hand, apple cider vinegar would work fine too. Flavor excellent. I loved cooking three things together, but my pasta stuck to the bottom of the pot. Any suggestions? You might need a little more water covering the pasta and you have to quick release right away so the pasta does not get mushy. How many people does one recipe serve. Should serve 6-8 people as a side dish.